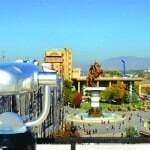 The city of Skopje for the first time has been mentioned by Klaudie Diolomej, under its ancient name “Scupi”. In the III century B.C. Scupi was founded by the Dardanians, and later with the coming of the Romanians it came under their rule. In this period, the city experienced real bloom on several fields, it became a large religious centre with its own bishop. In the year of 518 the city was destroyed by a disastrous earthquake. Wonderful architectonic buildings, numerous public baths and the antic amphitheatre built in a roman style, large basilica with mosaic floors have completely disappeared from the earth’s face. Since then Skupi is not mentioned any more. The Skopje valley got a new city centre called “Justiniana Prima”. By the end of the VI century, in front of the ramparts of the city the Slavic people have showed up, which managed to occupy and to slavicize it for a period of only one century. 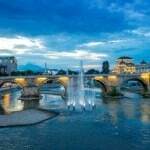 This area was settled by the Slavic tribe Beregheziti and gives the city the new name Skopje. During the existence of the first Macedonian state and the Macedonian czar Samouil, the city becomes part of the Samouil’s empire. In the later years a lot of conquerors have passed through the streets of the city, Bulgarians, Bysantines, Serbians. In the year of 1392, the city falls under the Turkish rule. Up to 1453 Skopje was a throne of the Turkish sultans and later it developed in a significant craftsmen and commercial centre. A lot of authors who write about their travels have expressed their delight from the city. The Turkish writer Dilger Zede who has visited the city in the XVII century says, “I travelled for a long time across that country of Rumelija and I saw a lot of beautiful cities and I was amazed from the Alah blessings, but not one has impressed and delighted me so much as the heavens city of Skopje across which passes the river Vardar”. On 25th of October 1689 in front of the city gates, arrives the Austrian general Picolomini with its army. An event with an outstanding significance for Skopje. “I decided to burn the city in order not to leave the enemy something that could be of use to him. Although it is not easy, I decided to turn the city into ashes”. From the hillsides of the Vodno mountain, Pikolomini was observing the fire: “I am sorry for the houses such as I have not seen at all in this war. The mosques are from the highest quality marble and porphyry, decorated with thousands lamps on a golden plated holders, which one would devote equal attention even in Rome. 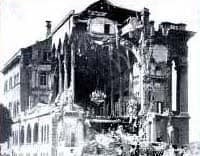 I feel sorry for the nice antiquities, gardens and places for entertainment.” The fire was raging for two days and except the massive stone buildings, the city was completely destroyed. Up until the half of the XIX century, the city could not recover back its previous appearance in front of which the numerous people who write about their travelling have stopped with a delight. In the XIX century, the city becomes an important traffic centre. Moving towards the countries from the middle east, Napoleon has found out the road through Skopje. A lot of merchants with their endless caravans loaded with various goods have been passing through the city. In this period the city reaches the biggest development of the handicrafts. Later, Skopje begins to change its appearance. 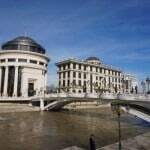 After the First World War on the right side of the river Vardar a modern city has been built. 26th of July 1963 is remembered as the longest day in the history of the city. Strong earthquake, of two severe and a few weaker shocks, turned the city into ruins. Numerous cultural monuments were seriously damaged or erased from the face of the earth. In today’s conditions the city is experiencing its own renaissance for many times in its history.